Discussion in 'Latest News & Discussion' started by satish, May 6, 2015. Vijayawada: The land allocation for three inland water transportation terminals under Inland Waterways Project were finalised by the State government. The lands were identified at Muktyala and Ibrahimpatnam in Krishna district and Harischandrapuram in Guntur district and they would be constructed for inland water ways to Amaravati capital. The State government expedited navigation plans to Amaravati capital city including operation of cargo vessels and tourism cruises. It identified 8.57 acres at Muktyala, 4.62 acres at Harischandrapuram and 5.5 acres at Ibrahimpatnam.The land will be acquired under land pooling system and would be handed over to Inland Waterways Authority of India (IWAI). The three terminals will be constructed with permanent structures and those are important to shift materials from Jaggayyapet to Amaravati for capital city construction. Majority of cement companies are located in the surroundings of Jaggayyapet in Krishna district. Cement can be transported by avoiding traffic snarls towards Vijayawada city for reaching Amaravati capital. One vessel can carry 1,000 tonnes of cement at a time which is equal to transport capacity of 30 lorries. Moreover, the cost is 50 per cent less comparatively to road transport way. The pollution and traffic difficulties can be avoided in the shifting of materials to capital city.According to plans, the cargo vessels will be operated for transporting cement, iron, bricks, granite and other materials for the needs of Amaravati capital construction. As per the estimates, two lakh to 10 lakh bags of cement is required on daily basis for the construction purposes including needs of private companies in the capital.On the other hand, the huge quantity of fly ash is available from power generation unit of Narla Tata Rao Thermal Power Station at Kondapalli. The cement companies can get fly ash to use in the manufacture of cement through inland waterway mode. Similarly, the concrete and other materials will be shifted to capital city at the Ferry of Ibrahimpatnam in Krishna district through Krishna river.Meanwhile, the higher officials committee chaired by Chief Secretary Anil Chandra Punetha took decision on Friday to allot land of three acres for construction of housing project to the employees of Inland Waterways Authority of India also along with land allocation for terminals. Vijayawada: Amaravati Development Corporation (ADC) chairperson and Managing Director D Lakshmiparthasarathy directed the officials to speed up the connecting roads in the capital region. She along with the engineering officials inspected E 12 and N 11 roads in Amaravati on Monday. She inspected the E 12 road connecting Errabalem and Neerukonda and verified the progress of culverts, utilities and storm water drain works. Similarly, she inspected the Sakhamuru-Lingayapalem N 11 road and enquired about the progress of works.Chief Engineer T Moses Kumar, Superintending engineer M V Suryanarayana, lands director B Ramaiah and other officers participated in the inspection. Lakshmiparthasarathy directed the officials to complete the two key roads E 12 and N 11 as early as possible. Andhra Pradesh, in this year’s racing series. The Grand Prix is the world’s foremost international series of single-seater inshore circuit powerboat racing. The race being the first international water sport being hosted by Andhra Pradesh, a great deal of significance is associated with it. The adrenaline-pumping battle will feature teams from Amaravati (India), along with seven major cities from Portugal, the U.K., France, Italy, China and the UAE. “The global sporting event is making a comeback to India after a gap of 14 years. The last Indian edition was held in Mumbai in 2004. We want to make the best of this opportunity to put Amaravati on the global map of water sports,” says Mukesh Kumar Meena, Secretary, Department of Tourism and Culture. Officials of the Andhra Pradesh Tourism Authority (APTA), which is playing key role along with India Xtreme Adventure Activities, a local firm, has cleared the race site. The ground has been levelled and asphalted for creation of the paddock area for the racing teams to hold their discussions. “It’s about time such sporting events came to countries like India, as there is adequate infrastructure here for people to engage in all kinds of extreme adventure,” says Marco Pietrini, Director, Logistics, F1H2O World Championship. Chief Minister N. Chandrababu Naidu will flag off the event on Friday (November 16) afternoon, leaving the space open for the racers to practice their manoeuvres. Jonas Andersson and Erik Edin, drivers from Sweden, will represent Team Amaravati. “I can sense the high expectations of people from my team and I can’t wait to take the waves in my stride,” says Mr. Jonas. The Tourism wing is setting up viewing galleries near the Punnami Ghat and the Prakasam Barrage will be closed during the three-day event, turning it into a makeshift viewpoint. Amaravati is hosting the fifth edition of the F1H2O championship that began in Portugal on May 18 and will end in Sharjah on December 15. “The race will be held in a circuit stretch of 2.7 km and arrangements have been made to allow the racers to practice in the river on the first day,” said Himanshu Shukla, CEO, APTA. The Andhra Pradesh government on Wednesday said that it had officially finalised its state emblem following the bifurcation of the state in 2014, for the creation of Telangana. The emblem was said to be inspired by art from the ancient Buddhist town of Amaravati, after which the state’s upcoming capital is also being named. “The State Emblem is inspired by the Amaravati School of Art. It consists of a ‘Dhamma Chakka’, the ‘Wheel of Law’ embellished with a ring of triatnas (Buddhist symbol) alternating with pinnate leaves and precious stones. The three circles of decorative beads in ascending order of numbers – 48 in the inner, 118 in the middle and 148 in the outer circle. ‘Puna Ghataka’ or ‘The vase of plenty’ is at the hub of the ‘Dhamma Chakka’. It is decorated with a four banded garland on the main body with medallions and tassels. There is a braid around the thin neck and a flaring mouth,” the state’s General Administration department said in a Government Order. The colours used in the symbol are green, red and yellow. Earlier this year, four years after bifurcation, the residual state of Andhra Pradesh announced its state symbols.The symbols were notified by the state government's Department of Environment, Forest, Science and Technology via a Government Order (GO). As per the GO, the state had retained blackbuck, commonly known as Krishna Jinka, as its state animal, while officials decided on rose ringed parakeet as the state bird. The GO issued by then Principal Secretary of Environment and Forests G Anantha Ramu, also mentioned that Neem has been declared as the state tree. After bifurcation, Andhra and Telangana also dropped water lily as their common state flower and while the former has now adopted the jasmine, the latter has gone with 'Tangidi Puvvu', which is commonly used during the Bathukamma festival. While the Telangana government decided its state symbols by the end of 2014 itself, Andhra did so in 2018, just ahead of the date marked as 'formation day' by Telangana. Amaravati, the capital city of Andhra Pradesh (A.P. ), was in the realm of imagination till a few months ago as multiple agencies, including the A.P.-Capital Region Development Authority (AP-CRDA) and Amaravati Development Corporation, had to do their homework before giving the dream a "concrete shape". The preparation of a master plan and designs could not be rushed through for apparent reasons, and then tenders had to be called for works costing about ₹48,000 crore. Basically, before constructing the government and other buildings, trunk infrastructure had to be created and this had also taken its time, as the tendering process was to be followed and men and material mobilised. After all, it was a gigantic task of building in 217 square kilometres a brand new greenfield city, which Chief Minister N. Chandrababu Naidu wanted to be one of the world’s best. The transformation of the fertile agricultural landscape into an urban agglomeration that matches the top liveable cities on the planet, made the aspiration rather over ambitious and one that could not be fulfilled in such a short span. However, the CRDA has achieved commendable progress, asserted its Commissioner Cherukuri Sreedhar, who insisted that a majority of the buildings would be completed in six months from now. The State government had roped in the Singapore Government to draw up the master plan, which was done in July 2015 itself, but then that was the only beginning of the long, arduous journey that the residuary State of Andhra Pradesh had embarked against heavy odds. As things stand, nearly 30 million square feet of official and residential space was being created in Amaravati, and the government is confident of crossing the first major milestone of finishing the construction of the judicial (High Court) complex by the year (2018)-end while most other structures progressed beyond the foundations in the last few months. The construction of the permanent government complex had also begun and the overall pace of works gained momentum as the Chief Minister himself took stock of the situation and warned of the consequences of inordinate delays in project execution. Mr. Sreedhar told The Hindu that barring the Assembly building, tenders have been called for all other constituents of the government complex. The five towers which will have the Secretariat and the offices of Heads of Departments (HoDs) are set for the raft foundation work to begin in a few days. Each foundation will be made of 11,000 cubic metres of concrete whereas a similar (raft) foundation of the Statue of Unity which earned its place in the record books as the world’s tallest, had only 5,000 cubic metres concrete gone into it. The tallest of them with 50 floors will be the one in which the Chief Minister’s Office will be located and its uniqueness is it will not have any column in the interior area of the building. currently under execution, and the creation of civic infrastructure (water supply, power and information and communication systems, stormwater drains and sewerage network) is in advanced stages. Utility ducts for them are being laid underground so that natural calamities will have the least impact of them. The Legislative Assembly and Council are being built on spike design with an overall height of 250 metres. Tenders for this complex are being called by the end of November. The High Court complex will be a little bigger with a built-up area of 12.50 lakh square feet and its construction is poised to be completed by January 1, 2019. The construction of 3,840 residential flats for MLAs, All India Services officers, non-gazetted officers and Class-IV employees has commenced and is going on at a brisk pace. The land has been allotted to Central Government offices and they were expected to be grounded soon. The CRDA chief said the overall progress could be easily perceived to have begun very late and plateaued later, but the fact that it is a project which has a few parallels in the country and hence needs its own time is to be kept in mind. He asserted that the grounding of the project in just 46 months after the master plan was drawn up, land pooled and basic designs finalised was in itself an achievement. About 20,000 workers were in the process of giving Amaravati a decisive shape in the coming months with all the essential trunk and LPS (land pooling scheme) infrastructure. Chief Minister N Chandrababu Naidu has said the launch of the first international flight service from Vijayawada to Singapore from December 4 will herald a new era in the history of Amaravati. 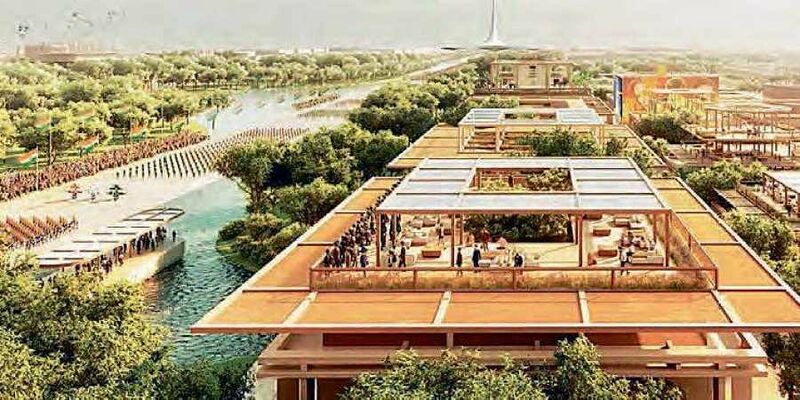 The Chief Minister Nara Chandrababu Naidu has approved the final designs of the Amaravati capital city, on Thursday here in Secretariat.The Minister for Urban Development P Narayana is scheduled to release the designs within a short span of time in Secretariat in a press conference. The designs including Assembly, Secretariat, High Court buildings and the blue and green concept designs of the capital city.After a marathon exercise, the Chief Minister accepted these designs. One can go through the virtual design of the Amaravati through this Youtube link. The GoM, headed by Finance Minister Yanamala Ramakrishnudu met in Vijayawada on Thursday. VIJAYAWADA: The Group of Ministers (GoM) dealing with land allotment to various institutions in Andhra Pradesh Capital Region Development Authority (APCRDA) limits resolved to allocate as many as 100 acres of land to six institutions on Thursday. The GoM, headed by Finance Minister Yanamala Ramakrishnudu met in Vijayawada on Thursday. It has decided to allot 80 acres of land to Saveetha Institute of Medical and Technical Sciences (deemed-to-be-university) in two phases for establishment of its campus in Amaravati. The institute, headquartered in Chennai, offers medical, engineering, management, law and other courses. The GoM said that 40 acres of land will be given in each of the two phases. Furthermore, the GoM allotted 10.2 acres of land to International Cricket Academy, 2 acres to Zoological Survey of India, 1.5 acres to Andhra Pradesh Public Service Commission (APPSC), 1 acre to Andhra Pradesh Crafts Council and 2.65 acres of land to Young Men’s Christian Association (YMCA). “The GoM also directed the officials concerned to issue notices to the institutions, which have not begun construction in the lands allotted to them. Initially, notices will be served on Indo-UK Institute of Health and BR Shetty Medicity. After holding meetings with other allottees, we will decide on issuance of further notices,” Municipal Administration minister P Narayana said. It may be recalled that the State government had allotted about 1,500 acres of land to more than 100 institutions, including central organisations and private companies, so far. Till the end of last month, the APCRDA has received only Rs 386 crore out of the total Rs 506 crore the institutions were required to pay towards the allotted lands. HRD Minister Ganta Srinivasa Rao, Social Welfare Minister Nakka Ananda Babu and officials were present.